The rue du Temple cuts through a warren of medieval streets and takes its name from a now vanished temple of the Knights Templar. The rue du Temple cuts through a warren of medieval streets and takes its name from a now vanished temple of the Knights Templar (cf The Da Vinci Code !) and also boasted the highest scaffold in Paris ! Close by, the rue Rambuteau is alive with pavement cafés, speciality food shops. Tempting boutiques in the Rue des Francs Bourgeois, the Place des Vosges is just a short stroll further, as are the Picasso Museum, Musée Carnavalet, the National Archives, the Pompidou Centre and much more! The Seine, the Ile St Louis and the Ile de la Cité (Notre Dame, the Conciergerie, the Sainte Chapelle) the flower and bird market, are also within easy reach by foot. The streets of the Marais are full of wonderful old buildings, secret courtyards and other architectural beauties. A favourite of both Parisians and tourists. We really fell for this sophisticated apartment, which is in a well kept late 19th C building. On the 6th floor (elevator to 5th then one flight of stairs) and enjoy exceptional panoramic view over Paris. An especially recommended apartment (some 50m2) entirely renovated while preserving charm and character, elegantly decorated. Stunning views over the rooftops of Paris to the Pompidou Centre, the Sacré Cœur and even the tip of the Eiffel Tower ! Entirely open plan (with the exception of the bathroom and WC) - light and space predominate. 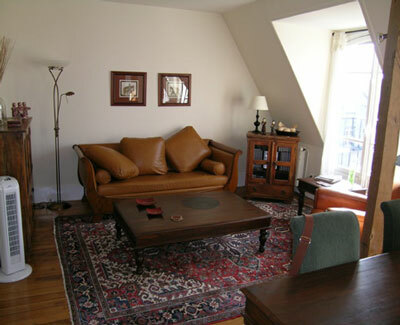 Living area : view of Sacré Cœur from the sofa (double sofabed), dining table with upholstered chairs, parquet floor and rugs, and excellent Kitchen area with divider bar, 2 gas hobs, electric oven, microwave. A wall conceals the Bedroom area with Double bed, TV to the left, and a small study to the right with a computer with free internet access and qwerty keyboard. Modern shower room with washing machine, and separate WC. Central heating. Initial Linen included. Local line telephone.